I’ve wanted to write about theme park refurbishments and expansions for a while now. It’s a subject that interests me greatly. I create my own virtual theme park attractions in Second Life, but it does not begin to compare to the real thing. With the new Harry Potter expansions at the two Universal parks here in Orlando, the world saw a new and more immersive theme park experience, unmatched by anything else. I was excited to hear recently that an old friend may be returning to his rightful home. Rumors have been circulating recently that King Kong was going to return to Universal Orlando. News that has been met with a positive response. 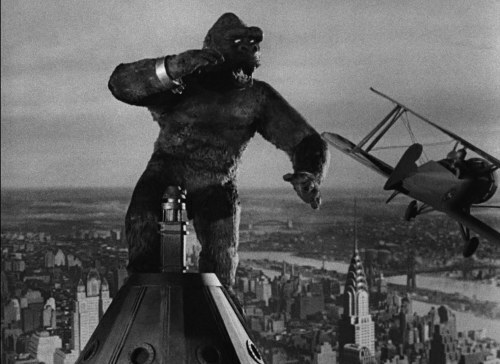 King Kong famously departed Orlando in 2002. While many fans were disappointed to see the big guy go, I understood that it had become too costly to run compared to its low popularity with guests. In my opinion the ride was too cheesy to survive a new age, especially considering a good show relied on the quality of your spieler’s performance. Much like the Jaws ride, getting someone who didn’t feel like being at work that day or who was in a bad mood could completely kill the experience for you. Originally many thought banana-breath was to take over the Beetlejuice/San Fransisco area of Universal, where Disaster (formerly Earthquake) is located. Instead it appears they’re bringing Skull Island to Islands of Adventure, a better fit for sure. It also seems that with the recent announcement of Legendary’s new Skull Island film, a ride/area of this theme is right on time. Many were questioning why Universal would build a new attraction for a nine-year old film regarded by many to be substandard, no offense to Peter Jackson. (Universal Hollywood did add a new Kong attraction based on that film just a few years ago, but it’s part of the tram tour and is entirely in 3D.) Instead, this new area will probably be modeled after the new reboot set to release in 2016, and will have nothing to do with the 2005 film starring Jack Black. The new ride and area has not yet been announced, but those close to the project say that it will not just be a 3D screen experience like the one in Hollywood, and that a true animatronic King Kong is coming. I for one am hoping to see a blended experience with real sets and full-scale animatronic characters in the foreground with 3D screens used only for backdrops. The original Kongfrontation had amazing sets and large-scale animatronics, but it was still hard to suspend your disbelief when the backdrops are black curtains and a hand-painted city skyline on a large wall. Using the illusion of depth a 3D screen creates they could finally create a dark-ride that feels truly vast. Disney’s Pirates of the Caribbean does a fantastic job of seeming large-scale, at least in the open waters scene, utilizing projected clouds and forced perspective construction. Yet other scenes still feel small with painted ceiling tiles and black walls. If the new ride does take place in the dense jungles of Skull Island, and not the cityscape of New York, it might not be an easy opportunity for the ride designers to hide the seams by setting it at night and painting the walls black. I have a feeling for this one we’re going to see bright vibrant colors under the scrutiny of (simulated) daylight. I can imagine full dome 3D screens and back-projected 3D screens used to expand the world forever, while a full-scale ape (and maybe other monsters) impress us in front. One can hope. Will Thunder Falls Terrace be lost to Skull Island? I hope to keep up on the construction of this project, as well as any other changes or improvements to the Jurassic Park area over the coming months so stay tuned.